I've been in a bit of a Nyquil fog this weekend. Those eerie, green horse-pills do strange things to me... They keep me up at night when I'm begging for sleep. They topsy-turvy me. I thought about what I would wear to church in the morning (my Rudolph-nosed self ended up staying in bed), I thought about our dinner menu for the first week of November (it's a sickness I have) and then I remembered that the next day was Six On Sunday day, and all I can tell you is that it came to me like sunshine on a cloudy day - Supermodels! I think I've already shared my early 90's obsession. It was legendary. It was mostly secret, but it was still legendary. At least in my mind. Homegirl was always my favorite. If you don't believe me, just ask Sarah. There was something about her face that was a bit otherworldly, in a good way. She was also just aloof enough to be a bit enigmatic, maybe a bit of a loner, and that always speaks to me. Plus, I like the name Helena. So there. K-Mac emerged at the tail end of the reign of the pretty, curvy girls. All straight lines and scowly face, odd hairdo and piercings, she was the sour pickle to their cotton candy. She raged in with the Grungy girls and gave a whole new meaning to the catwalk stomp. I loved her for the fact that she was living proof that a girl with a very, ahem, unconventional look, could still be seen as beautiful. She created a ruckus when she shaved her eyebrows off and recently did it again when she emerged from "retirement" with naturally grey hair down to her booty. She's a rule-breaker. She defies convention and even today, refuses her spot in my center-aligned, single-file line. It's all good, K-Mac. We would expect nothing less. This cat stayed mostly above the fray. I can't recall even a morsel of juice about her. What I can say is that she was scrawny and brown-eyed and not especially striking, and I liked it. Claudia Schiffer - Guess jeans. 'Nuff said. In the end though, she dated David Creepyfield and that just says something about her. I'm sure we'll all rest better tonight. Be careful with the Nyquil, girlie! That stuff gives me hallucinations instead of dreams. The last time I took it, I went to sleep and thought I was a carrot for eight hours. They don't make supermodels like they used too. Being an Aussie, Elle McPherson is,naturally,in my top 6. I love Cindy too, especially cos she was never a skinny girl. Such a fun post Shannan. Paulina Poriskova? I'm sure I didn't spell that right. I always liked Cindy Crawford...just an american beauty, oh and Christy Brinkley. Hope you feel better soon. Honey just got over that snotty mess. Fun! Fun! Well, I am a lot older... Margeaux Hemmingway, Iman, Jerry Hall, and Lauren Hutton, and Christy Brinkley. Feel better soon. Nyquil is some good stuff!! I love it so far:) Thanks for the recommendation! I think you need to stop watching so much tv, and reading so many magazines. Do you like felt? First, I'm sorry your sick! If we lived nearby, I'd bring you soup! Second, Nikki was my favorite. I kept that Seventeen magazine for years! My best friend and I would argue over who looked more like her! (neither of us did!) I also liked and still do Christy. She's gorgeous! I always liked Patti Hanson too....only found out not too long ago that she was married to Keith Richards of the Rolling Stones. I always like Paulina Porizkova too. As I was scrolling down I kept thinking of one of the best supermodels this side of the mississippi and waiting for her name to appear...how could you have made such an error...after all we've been through together.!! ..as if my luggage rack pose wasn't good enough!! Oh hope you sleep better tonight...those pills that say NIGHTIME on them...keep me up tooooo. Get better hugs to you. I loved all these girls too...helena always had the "other-worldly" thing going on. Remember her in Chris Isaac's video--whoo! gotta hose down :) How fun to jaunt down my high school path tonight! I hope you feel better, girl! I so appreciate this post. I love me some 90's supermodels. Weren't these chicks in a George Michael video at some point. I remember buying the Seventeen with Nikki Taylor on the cover. What was up with her busting out twins when she was like 19??? Crazy! I do love L.Evangelista too. Hairstyles only, I need to specify. Glad to see you didn't forget Nikki T.! ;) And a nice shout out to Krissy (RIP), although you failed to mention Nikki's most horrific crash. Also, I was hoping for a photo of the NEW Kristen McN. And you didn't mention that Christy was a smoker, remember? and turned into an anti-smoking advocate and she's married to hottay Ed Burns! And I think someone is right here, didn't you like Paulina P? And of course, I shared your fondness for little-known Trish. Hey girl, what about Cindy Crawford?? I love me some Cindy. Nothing better than a girl that was going to college to be a Nuclear Engineer becoming a Supermodel! I've never known much about supermodels - thanks for the lesson! Hope you feel better soon! Oh Turly was so my girl! i just can't stay quiet here....what about linda! as in evangelista??!?!?!? 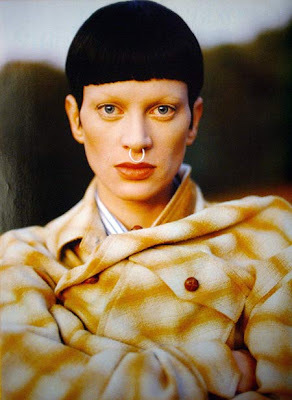 she is my absolute favorite supermodel.....and brave hair coloring muse extraordinaire!